I am really particular about stuffing. 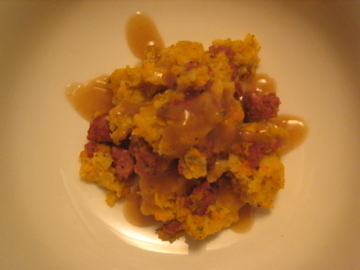 First, I don’t like cornbread stuffing. Second, I don’t like chesnuts in my stuffing. Third, don’t ever put the words “wild rice” next to “stuffing” in my presence. Stuffing comes but once a year, and I like it the way I like it, period. Is it the same as stuffing? Is it just a different word? An alternate cooking method? Stuffing that originated from the South? So many questions about dressing. But when you look at enough recipes, for both stuffing and dressing, it becomes clear that the real difference is an egg and some cream- dressing is savory bread pudding. All my life I’ve never had a stuffing baked in an egg and cream mixture, but almost every dressing recipe I found contained these two things. And well, I had to try it, if only to find out whether or not I am as picky about dressing as I am about stuffing. I made the below recipe last night, and I have to say, it was delicious. I can’t emphasize the bread pudding aspect enough- parts of this were almost custard-like. I would never have referred to stuffing as decadent or creamy, but this dressing was both. Puree carrot, onion, celery, and herbs in a food processor. 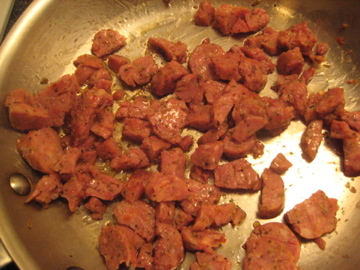 Warm sausage in pan- it is already cooked so you just want to warm it, brown it a bit, and release the oils to be mixed with the rest of your ingredients. 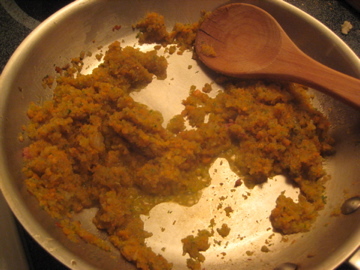 Remove sausage from pan (leaving the drippings), and add vegetable puree. Cook puree for 5-10 minutes on medium-low heat, until most of the water from the celery has cooked off. 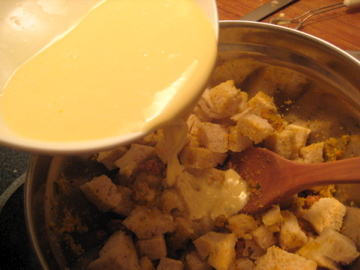 Put sausage, vegetable puree, and bread cubes into a large bowl and mix. Put mixture into a buttered baking dish, bake for 30-35 minutes at 375. Voila. Picky as I am, I would absolutely make this dressing for any holiday meal. But I would also make stuffing.